This Is F'ed Up ~ The Bucky Channel - The World of Sports from Wisconsin's Perspective. You're telling me the same man who cried his way into retirement back in March is the same man who held up a brand new Jets jersey in August? Even though I agree that the Packers are better off moving on, I never thought I'd actually see Favre hold up the jersey of another team. I still, looking at that picture, can't wrap my head around it. I don't think Favre can, either. He seemed anything but comfortable at this introductory press conference Thursday afternoon, and his body language almost seemed to suggest he was forced to settle for this outcome. You can't tell me that when Favre decided he wanted to come out of retirement that he ever envisioned playing for the New York Jets. He tried to say all the right things today, going back on his desire to play in the NFC North, and saying he didn't want to talk to the Jets about a trade because he knew he'd be convinced to play there. It was like listening to a kid trying to tell his teacher his dog ate his homework (quick aside: I wasn't sure about that line, and thought about whether or not to write it for about three minutes. It just seems a little too "Rick Reilly" to me, but I couldn't think of anything better). 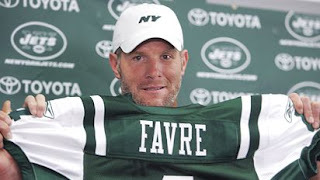 The Jets are happy to have Favre though, make no mistake about that. They are now relevant in the NFL again. They already have a game scheduled for Monday Night Football and on the NFL Network this season, don't be surprised if one (or two) of their late season games get flexed to the Sunday Night game, especially if they're in playoff contention. Ultimately, I think Favre will adjust to his new life and new surroundings just fine, although it will take a little getting used to and their will be some growing pains. It will probably take him awhile to even become somewhat comfortable with the Jets playbook, and longer to get back into a rhythm. At least he has his old friend, Bubba Franks, alongside with him. The Jets made a lot of key moves in the off-season, and I think they'll be a much better team than they were a year ago. Honestly, I do believe they are now a playoff team, barring a Favre injury (which I also think is quite likely). However, slow down with any dreams you may have of a Packers/Jets Super Bowl, or of the Jets making the Super Bowl at all. We've all seen Favre's track record in the playoffs since 1996, and if he couldn't do it with the Packers since then, he certainly won't be doing it with the Jets. Best of luck anyways, Brett. We'll be watching, whether we believe it or not.